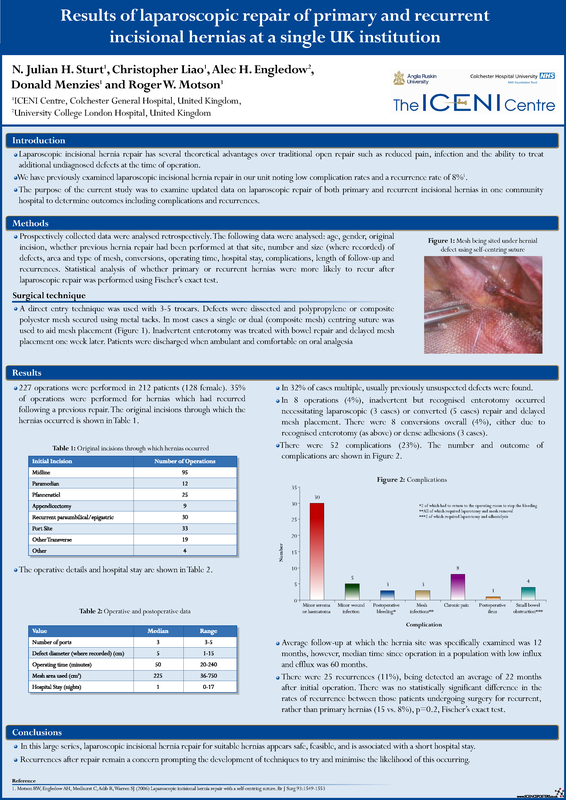 Laparoscopic incisional hernia repair has been gaining increasing recognition with its perceived benefits of shorter hospital stay, decreased postoperative pain and the ability to diagnose and treat previously unrecognised defects at the time of operation. In this study incisional hernia repairs at a single UK institution between 1994 and 2008 were analysed with respect to short and long term results. Prospectively collected data were analysed retrospectively. The following data were analysed: age, gender, original incision, whether previous hernia repair had been performed at that site, number and size of defects, size and type of mesh, conversions, operating time, hospital stay, complications, length of follow-up and recurrences. 227 operations were performed in 212 patients (128 female). Mean age was 60 years. 35% of operations were performed for recurrent hernias. In most cases 3 ports were used with a self-centring mesh technique, a minimum 3cm of mesh overlap, a single circumference of metal tacks and omental interposition. Initially one centring suture was used but towards the end of the series the technique was modified to employ two longitudinal sutures. In 32% of cases multiple, often previously unrecognised defects were found. The average defect size was 4.5cm (range 1-15cm). Polypropylene mesh was used in early cases with a composite polyester mesh being employed after 2005. Mean operating time was 60 minutes (range 20-240 minutes). There were 8 conversions (4%), either due to recognised enterotomy or dense adhesions. Median hospital stay was 1 night (range 0-17 nights). There were 52 complications (23%) including 30 symptomatic seromas or haematomas and 5 minor wound infections. There were 3 postoperative bleeds 2 of which required laparotomy. 3 mesh infections required laparotomy to remove the mesh. 8 patients complained of chronic pain postoperatively. One patient developed a postoperative ileus which settled with conservative management. 4 patients developed small bowel obstruction postoperatively of which 2 required surgical intervention. Average length of follow-up at which abdominal examination was performed was 12 months, although the nature of the local population and hospital meant that true follow-up is likely to be longer. There were 25 recurrences (11%), being detected an average of 22 months after initial operation. Recurrence appeared to be higher in those undergoing operation for recurrent hernia (15 vs. 8%), although this difference did not reach statistical significance. Laparoscopic incisional hernia repair for suitable hernias is safe, feasible, and is associated with a short hospital stay and the ability to diagnose and treat previously unrecognised defects of the abdominal wall. Recurrences after repair remain a concern prompting the development of techniques to try and minimise the likelihood of this occurring.